Today may have been a day of working around the new house installing gutter extensions, but I’m grateful for a little down time to sit on the gravel pile — unleashing my long-distant 10-year-old self to sift through stones. I come away with a pocket full of unusual ones, three fossils, and a little chagrin at how easy it is to look at something — in this case, a load of gravel — but see only a a swath of similarities. 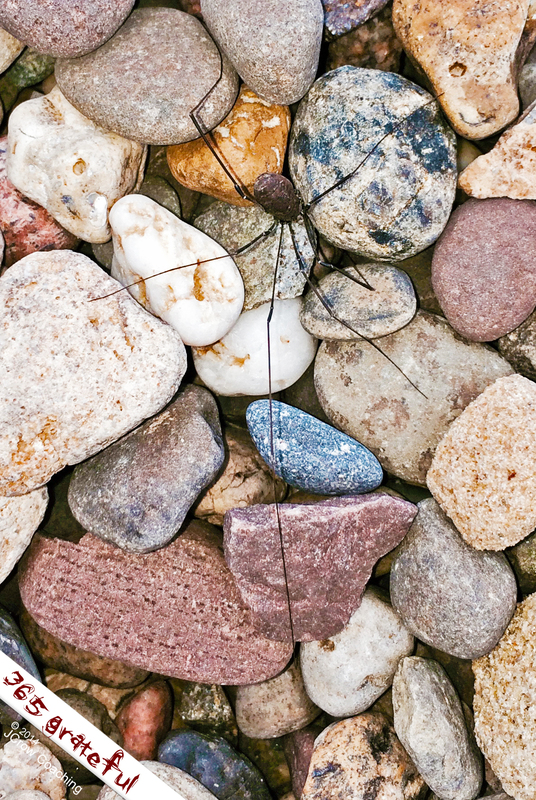 In reality, that pile of nondescript gray gravel houses an amazing universe of variety — shapes, colors, sizes, types of rocks — even fossils and a curious Granddaddy Long legs. Grateful for the lesson in mindfulness.